How much history do we know of the exact place we live? What was going on at the place your home is sitting, say 100, 200 years ago? We literally walk around on hidden histories, not seeing, not even knowing them. Through an unexpected series of events, tonight I found myself for maybe 2 or 3 hours, scraping and poking around the internet seeking to find the hidden history beneath my childhood home. Someone send a long rope down this internet hole- I am trying to locate my childhood home on a map from 1877. This started at Kate Bowle’s US/Not us blog post about last week’s Digital Pedagogy Lab Institute at the University of Mary Washington. Kate mused on not knowing about Fredericksburg, then looking it up, then finding it was “that” Fredericksburg in terms of being the site of Civil War battles. 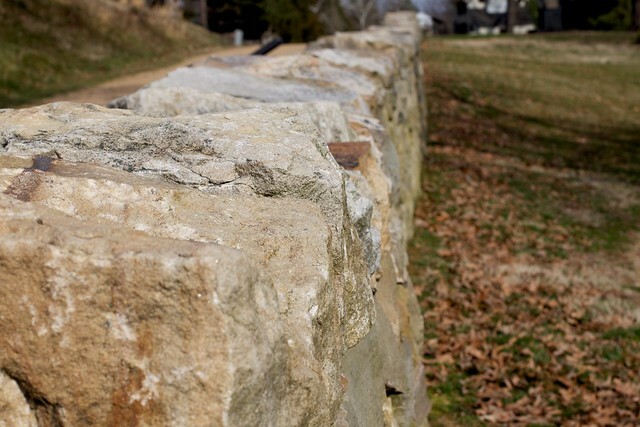 That triggered my own memories of the months I lived there in 2012, I could walk a few blocks up Marye Road and turn on Sunken Road (the same road that is a margin of the UMW campus) and walk along a wall that provided shelter to Confederate artillery. In Fredericksburg you cannot help but stub your toe on something related to the Civil War. The home in Baltimore where I grew up was on land that was part of a plantation that most likely owned slaves. This invisible history lies where I rode my bicycle and played baseball. A wooded lot one block away from my home was rumored to be the place where a few slaves were buried who fought for the Union. It held some amount of haunted fear, I never was brave enough to go look. On a last visit to my old neighborhood, I noted a newer house was on that corner. Hmmm. There is quite a bit of conjecture here. Yes, I can remember the corner lot that was wooded and nothing built on it, in the middle fi a densely built out suburb. There was a story that on that lot was a place where a few slaves who fought in the Civil War were buried. Supposedly they were unmarked except one. This was a neighborhood story, and I actually never even ventured onto the lot, no Stephen King curiosity of a dead body. Maybe it was fear of graveyards? I was a dorky kid. I wish I was more curious. And even more curious when the last time I drove through the old neighborhood (2008?) that there was a newish house sitting on that lot, the trees trimmed back, just another suburban house. Built on a place that, if my neighborhood story was correct, was a graveyard. Maryland in the time around the Civil Was was a mix of free blacks and slaves, so I have no sure reason to assume the story, if it were true, was about slaves who fought in the civil war (my story nowhere as powerful as Michelle Obama’s). This lot was one street away from mine, maybe 3 houses between it and mine. What was this land like 100+ years before I was riding my bike around on it or playing tag in the woods? While in the 1960s and 1970s it was on the edge of the city of Baltimore, in the mid 19th century, this was rather far out in the country. How could I even find more information? Hello internet. My first idea was thinking about Pahl’s Farm. While we did live the burbs, in the middle of it was the remnants of an old family farm that still grew and sold fresh produce. In the summer my Mom would send me out with a buck or 2 to walk up to the old stand (it was right across from my junior high school) to pick up ears of fresh corn. In 1972 some bad kids lit the wooden stand on fire (they rebuilt a modern block building in it’s place, still standing there). 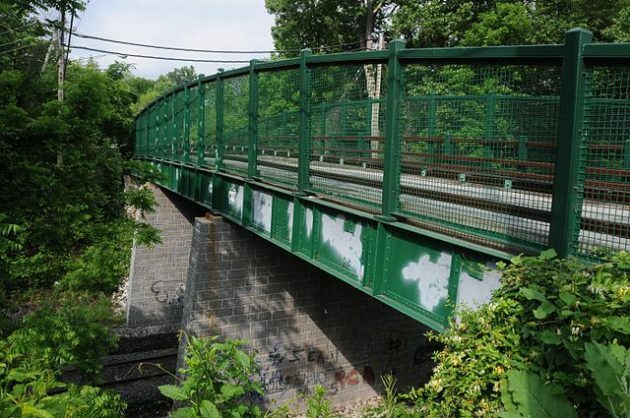 In the 1850s, prominent Baltimorean James Howard McHenry (1820-1888), grandson of the famous statesman James McHenry and the Revolutionary War hero Col. John Eager Howard, purchased over 850 acres of land in Pikesville and named his estate “Sudbrook.” At that time, the only way to travel the eight miles into Baltimore City was by horse and carriage over bumpy dirt roads, a problem McHenry eventually solved by securing train service through his property in the 1870s. With transportation in place, McHenry actively sought to develop his Sudbrook estate as a “suburban village,” a concept in its earliest infancy. McHenry hired Frederick Law Olmsted, Sr (yes that one) to design Sudbrook Park — it never got built as planned, but did become a rather stately neighborhood. One if it’s distinguishing featured was an old one lane wooden bridge over the railroad tracks. 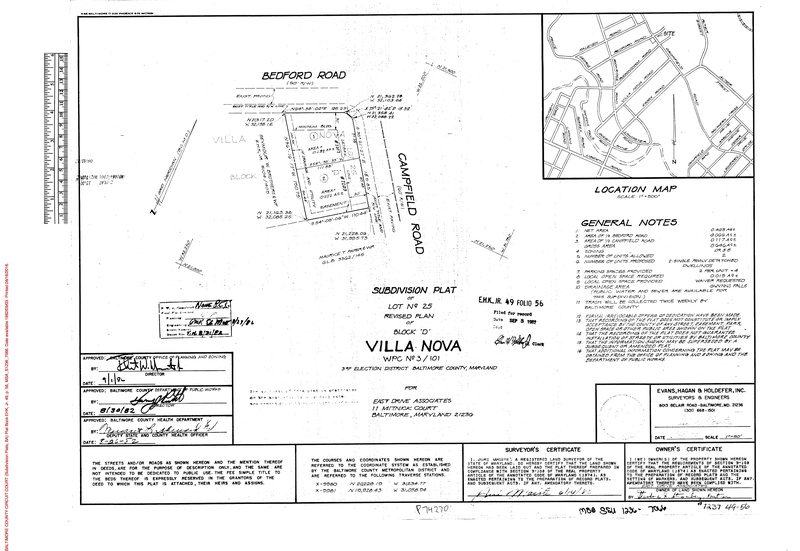 I wondered if McHenry’s land extended south of Milford Mill Road. 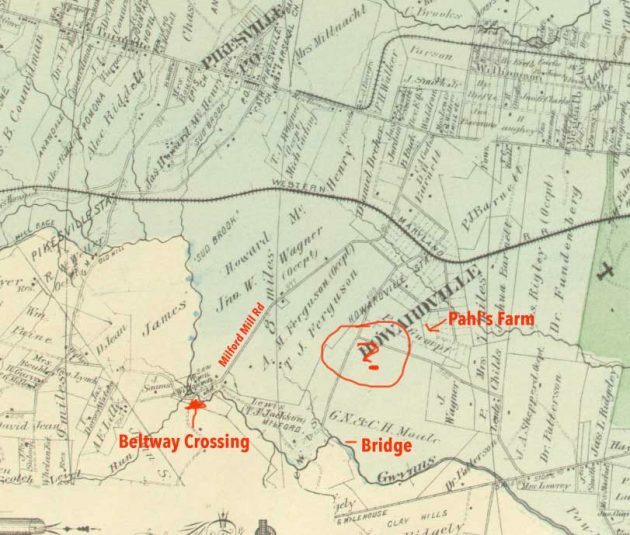 I then began looking for historic maps of Baltimore County- finding the ones published by GM Hopkins in 1877 (about the era I was looking for). The first site I looked at was a genealogy site and while I could scan the maps, they were covered with watermarks and available only for sale. Plus they did not have the map of the third district of the county where my old house would be located. Luckily I found the Johns Hopkins University Jscholarship Site“>full set of maps at the Johns Hopkins University Library’s JScholarship site. I spent some time trying, not succeeding in overlaying a modern Google Maps atop the old maps. I was able to find the spot mostly by matching the patterns of the creeks- Gwynn’s Falls (which flooded the bridge on Buckingham Road in 1972’s Hurricane Agnes). The railroad on the map lines up with the current location of the tracks now used by the Metro. I could see where Scotts Level Creek emptied into Gwynn Oak Creek, which is right near the intersection of Milford Mill Road and the 695. Milford Mill Road, was also easy to match, and the old Mill (near my highs school of the same name) is shown. And what about that house? Google maps got me an address. I was able to look up its title and parcel information from the SDAT web site , and something that is key, a “plat” number. I saw that it was built in 1988. I had to create an account on the Maryland Land and Record’s site, and made some lucky guesses with an arcane search tool that seemed to look more for court IDs. But there was a form that took the plat numbers, and I got a screen of property references in no particular order. 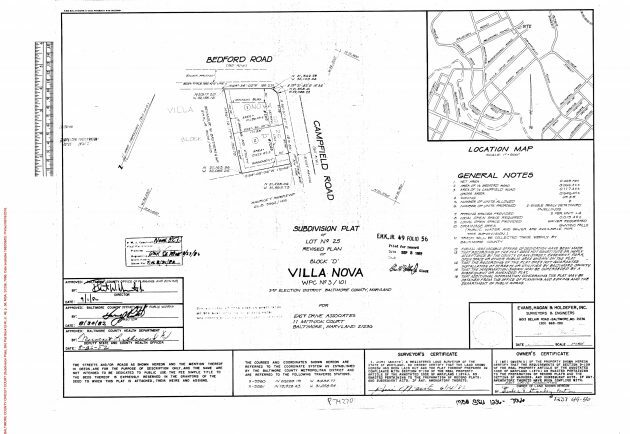 I did a page search on the street name, but hit nothing, but on a whim, I tried the development name of “Villa Nova”- and got 2 hits from the early 1980s. It did not really tell me much, and now I am thinking I’ve gone as far as I could. Tonight. The thing is- IF the neighborhood story is true, and IF this house was built in the 1980s, then some kind of archaeological survey would have been done, and perhaps even the graves moved. There should be a record of that somewhere. I might have to put up a bat signal for my favorite librarian. This is also way past the point where I wonder why I am fixated on this. But still, the back yard where I played as a kid– what was that like in the 1860s? Was it dense forest? Was it cultivated fields? By who? These hidden histories are right beneath out feet. It might take some scratching to et below the surface, but whatever you find should be interesting. 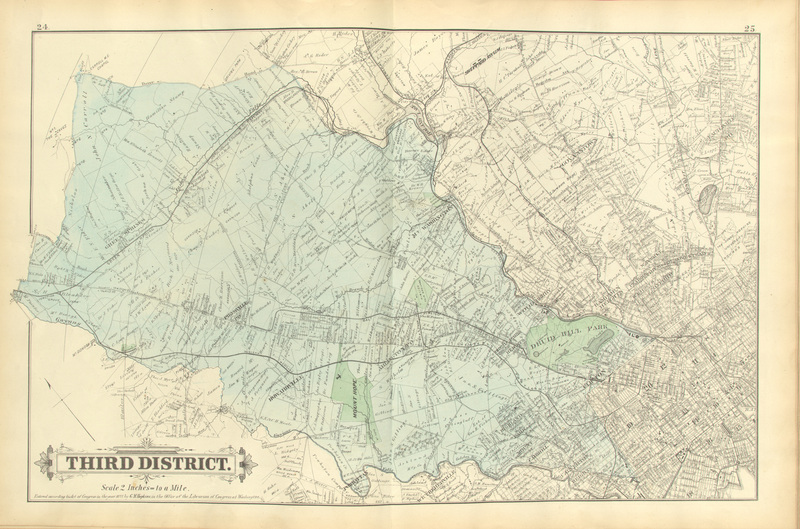 Top / Featured Image: Third District map of Baltimore County from Atlas of Baltimore County, Maryland 1877 (Hopkins G.M) found at the Johns Hopkins University Jscholarship Site. This license shall not authorize the commercial use of the Materials by Johns Hopkins or any other person or organization, but such Materials shall be restricted to non-profit educational use. That’s me, non-profit educational use. That is a fascinating history lesson. Because I have always lived in the West, I have never lived on a location that had more than a couple generations of history dating to wagon train (1840s) days; then it was native history, then geological history, and then turtles all the way down. Wherever I have lived, I have done these layers of research. Except for my California years, I have lived my life on the alluvial clay of the Bretz Floods. You wouldn’t consider Eugene to be in tsunami country, but the ancient Missoula floods swept down the Columbia and up the Willamette Valley over and over, hollowing and widening where the river couldn’t reach. Thanks for this time travel post. Not to mention the eruption of Mount Mazama 7000 years ago forming Crater Lake! Or blanketing of your area with ash from mega eruptions at Long Vally in California 700,000 years ago. And oh wow, the ripping apart of Pangea was a real shaker. So much to wonder about what the land used to hold. It makes me really happy for people 100 years from now to be able to have images from Google Street View. I hope that Google will retain all the images from Google Street View. Such an amazing collection for people to be able to see 100 years from now to uncover what their neighborhood looked like a century ago. It’s nice that Google has started to offer us the chance to look back to every set of images taken since, what, 2008.